A group of young tech entrepreneurs will today present their Start-up Manifesto to Deputy Prime Minister and Minister of Digital Agenda and Telecommunications, Alexander De Croo. The Start-up Manifesto embodies concrete proposals for an improved start-up climate in Belgium, and De Croo will take the proposals into consideration when compiling his Digital Agenda for Belgium this spring. Through a viral invitation, the young entrepreneurial community received over a hundred individual proposals and ideas that were eventually included in the Start-up Manifesto. They are submitting the manifesto to De Croo to mark Tech Start-up Day. ‘The economic situation in Europe and in this country remains challenging,’ said De Croo. ‘But through this manifesto, young tech entrepreneurs are clearly stating that they are helping to further develop the digital economy in Belgium. We must nourish that young entrepreneurship and give it every possible chance to flourish. That is why I will be considering the recommendations when composing the Digital Agenda for Belgium, so that we can make the switch in terms of both policy and mentality,’ De Croo said. Bruno Colmant, a member of Digital Minds, the collective body of digital thinkers and doers overseeing the start-up and roll-out of the Digital Agenda for Belgium, took the opportunity to present a study demonstrating the economic potential of digitalisation. According to the study, digital technology in a broad sense contributed to 86 percent of the economic growth in Belgium between 2000 and 2012. Aside from a jump in the number of jobs available in digitally-driven sectors, digitalisation was also responsible for increased productivity in other sectors. These gains in productivity in turn led to further growth and jobs. Speaking at the Mobile World Congress in Barcelona, Alexander De Croo confirmed that Belgium advocated the fast-track scrapping of roaming charges throughout the EU, this after the European Council and Parliament had started attempts at conciliation as the opinions of the two bodies were too divergent. Because the opinions of the European Council and Parliament were too divergent, the two bodies have started attempts at conciliation. ‘I hope that this process leads to roaming charges being relegated to the European history books as soon as possible. 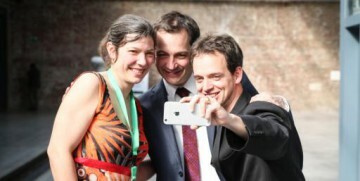 Belgium will in any event continue to advocate the fast-track scrapping of roaming charges,’ De Croo said.